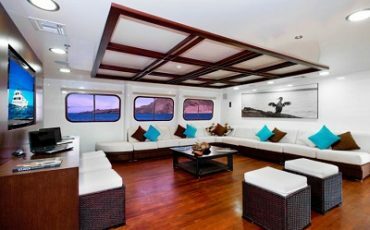 The Cormorant Catamaran offers a very comfortable first-class experience: All cabins (258 ft2) and suites have panoramic floor-to-ceiling windows and private balconies. 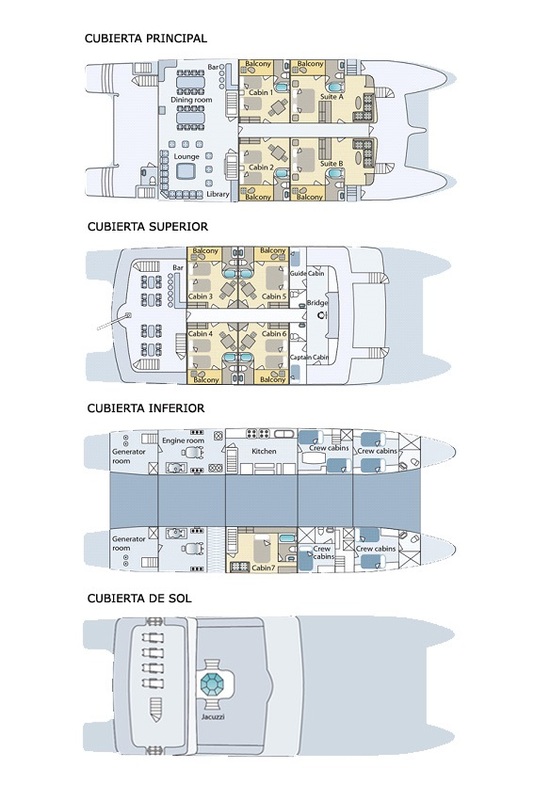 If you’re looking even for more comfort, two larger suites with a spacious lounge (409 ft2) are also available, making your Cormorant cruise a truly luxurious experience. 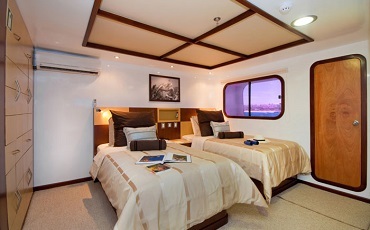 For families or friends, the catamaran offers 4 interconnected cabins on the upper deck. 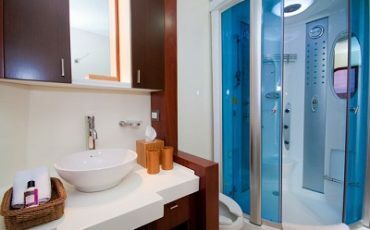 Common areas include a jacuzzi, a huge sun deck, bar and lounge. Kayaks are also available for use. 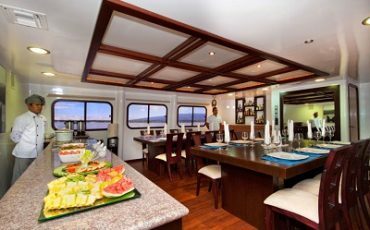 Your Cormorant cruise combines first-class quality with competitive pricing, making your Galapagos experience an affordable luxury. AM: Arrival in Baltra airport and transfer to the boat. Meet and greet with the crew and briefing about the boat and the island. 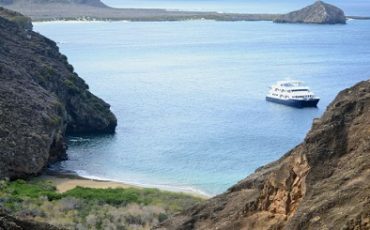 PM: Cruise to Sullivan Bay at Santiago Island with its impressive lava-formed ground. Possibility to observe Oystercatchers, great blue herons, lava herons, lava lizards, marine iguanas, mockingbirds. 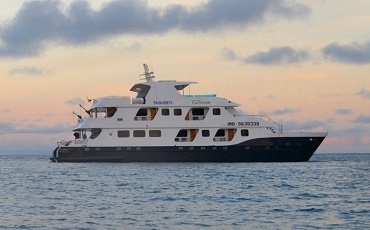 AM: Cruise to South Plaza Island with the largest land iguana population on the Galapagos. 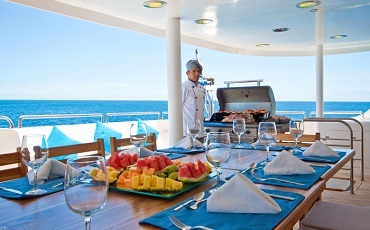 Enjoy the spectacular views from the cliffs and the unique vegetation. You may observe nesting swallow tail gulls, lava lizards, Madeiran storm petrels and snorkel with sea lions . 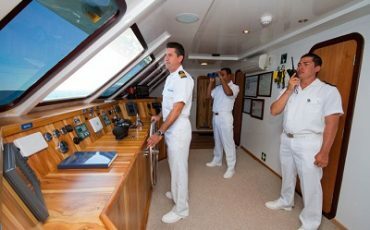 PM: Cruise to Santa Fe Island with its forest of Opuntia cactus. Observe for example swallow-tailed gulls, red-billed tropic birds, and sehar-waters petrels as well as land iguanas and lava lizards in the cliffs. 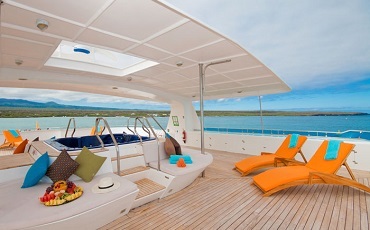 AM: Cruise to San Cristobal Island. Observe brown pelicans, blue-footed boobies, sea lions, and marine iguanas on the white-sand beach. You can snorkel in the turquoise water. PM: Visit Pitt Point and enjoy great views after walking up to the higher part of the island. When you are lucky you see red footed booby or even Chatham mockingbird. AM: Excursion to Lobos Islet, the sea lion island, and observe blue-footed boobies, great frigate-birds, brown pelicans, lava gulls, common noddies, yellow warblers and small and medium ground finches. You have the possibility to snorkel and to swim with the sea lions. 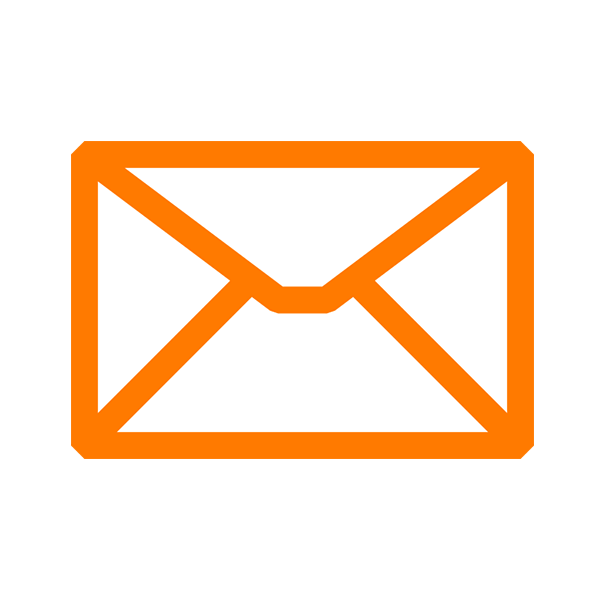 PM: Return to San Cristobal Island and transfer to the airport for your national flight back to the continent. 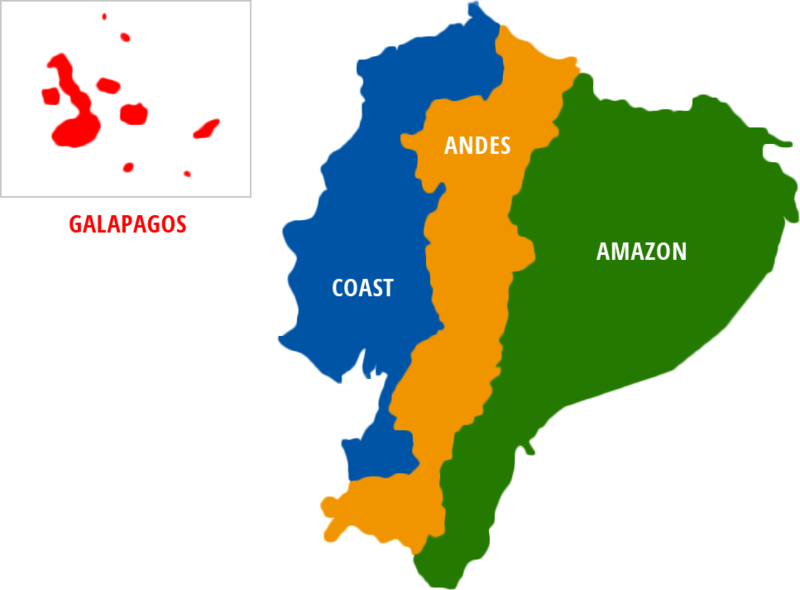 International airfare to and from destination; Galapagos National park entrance fee US$100,- per Person (to be paid in cash at arrival at the airport in Galapagos); Transit Control Card US$20,- per Person (to be paid in cash at the airport in Quito or Guayaquil); meals not described; cost of medical immunizations as needed; trip cancellation insurance or any other travel insurance; cost of optional activities; excess baggage charges; airport taxes (if any); alcoholic beverages or soft drinks; optional gratuities to your guides; items of personal nature.